That the recent internet security flaw Heartbleed could affect you? Heartbleed is an internet security flaw it does not affect your machine directly. All of the major internet companies and websites that are affected have taken steps to ensure your safety. Don’t click on EMAILS that ask you to change your password. If you think they are genuine go directly to their WEBSITE that asks you to change your password & make sure you do. 2. Secondly make sure you have updated your PC. Microsoft has recently stopped support for Windows XP, but Windows 7 & 8 have updates which keep you secure, do them. Windows XP is compromised, so call us if you need advice on your options. Upgrade or purchase a new PC from Sevenoaks Computers to ensure security. 3. Thirdly complete your protection with a recommended Security package / Anti-Virus. It is ESSENTIAL that you keAdd Mediaep a professional Anti-Virus package updated. The free anti-virus softwares are limited and are not guaranteed to protect you. 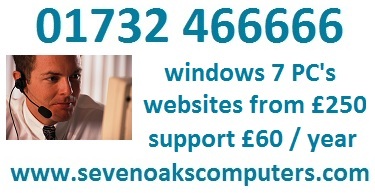 At Sevenoaks Computers we provide advice and affordable anti-virus packages that will keep you safe. Why not drop into our shop for some help and advice? With a great range of PC’s and Laptops, with either Windows 7 or Windows 8, we can advise on the best course of action for you. Give us a call on 01732 466666 for a free consultation.